Hayling Island Labs - After Hours: Moving house .. The laboratory is upping sticks and moving - just as soon as we sell. This does mean that I have had to suspend electronical things for the time being, to sort out the house. Well, my motorbike has needed some attention too. And I did put a new satellite dish on the wall, since Fireball, the house server has moved out of the office downstairs. I thought I would use it to watch TV in the front lounge, (I have a suitable satellite card for it) but I then found there was no satellite signal. 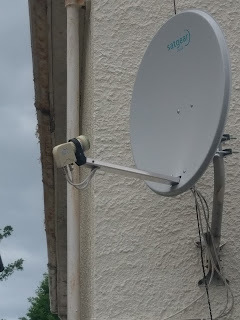 Living on Hayling does mean that the air is saturated with salt water sometimes, and the LNB arm had rusted pretty much all of the way through, and wasn't aiming right any more. No way to sell a house, is it? You need to project the image of a house being taken care of for the prospective new owners. New dish on the wall.